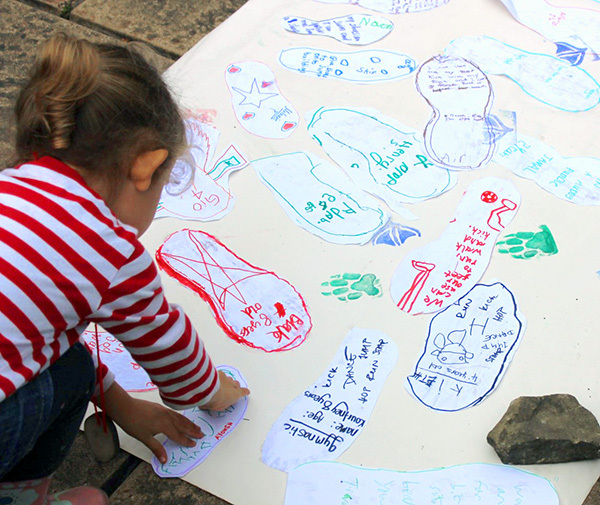 Friends of Burgess Park (FOBP) co-ordinated The Big Draw family pop-up events in Chumleigh Gardens, Burgess Park in October over three days of half-term (FOBP footprints workshop pictured). 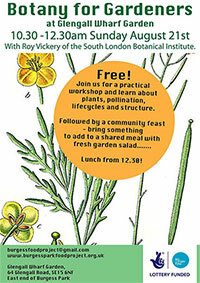 The venue has changed to Chumleigh Gardens Almshouses, Albany Road SE5 0RJ. This a short walk from the Old Library, Wells Way. This is the ideal opportunity to consider next steps in our campaign to get the building repaired and develop a long term plan. We wish to establish a community based stakeholder group with representation from local organisations to help take this project forward. 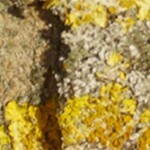 Please come along to find out more. Theatre Delicatessen who recently took up residence in the Old Library will outline their plans for the next year. The formal AGM will receive the end of year report and accounts and appoint the new committee. Draw and design transport from the past, present and future. Help make a large masterpiece with First Place Nursery. 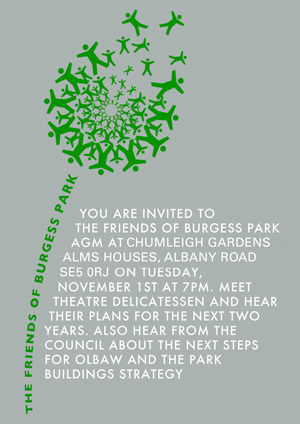 Learn about wildlife with Friends of Burgess Park. 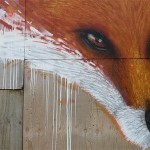 Print animal tracks from Burgess Park wildlife onto paper and wood to take home. Can you discover the whole rainbow around Burgess Park? 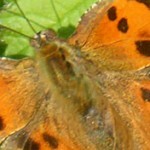 Hunt for colours then make prints on fabric from leaves and flowers with London Wildlife Trust. Halloween pumpkin carving with artists from Art in the Park. Please BRING YOUR OWN PUMPKIN. Top tips for container growing from Garden Organic master gardeners. Take away your own sprouting pea plants. Create wearable willow sculptures to make your own unique drawings as you move. 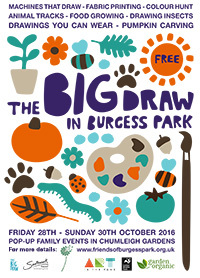 Find out more about The Big Draw – a global community celebrating the universal language of drawing. Bring your picnic, rugs and chairs from 6.30pm. 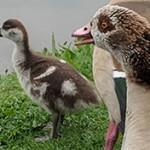 We are on the slope between Chumleigh Gardens (SE5 7QH) and the lake. 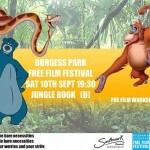 We are working with Peckham and Nunhead Free Film Festival. Stewards needed to help with both films, please get in touch. This weekend is a unique opportunity to see a historic film made by Walworth Academy pupils in 1962. 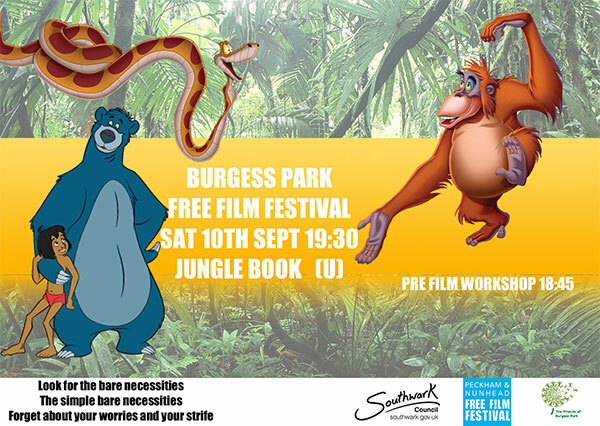 “Two Bob’s Worth of Trouble” is being shown at the Burgess Park open air Free Film Festival on Friday 9 and Saturday 10 September, 7.30pm. The dramatic film was made by Walworth School pupils showing life for youngsters in 1960s Walworth and Camberwell. The film includes shots of bombed houses in process of demolition, the canal, the school and Burgess Park. 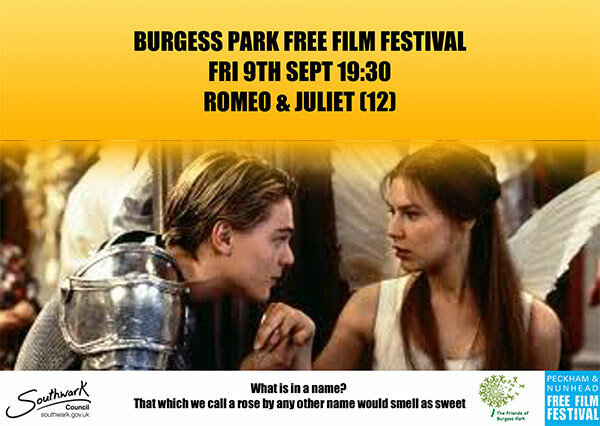 The film is held by Southwark Local History Library and is being shown as part of the fim festival in Burgess park with Peckham and Nunhead Fee Film Festival. Camberwell Fair comes to Burgess Park next Saturday with music, community stalls and entertainments. 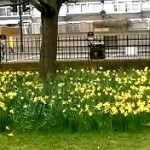 Taking place in the Camberwell end of the park it is led by local music promoters. After a successful event on the Green last year it’s moving to a bigger space for 2016. 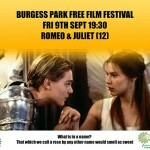 FOBP will have a stall where we will be promoting our Free Film Festival. Some extra helpers needed please for one hour slots to help with our two art-focused activities and give out film flyers. Creation Trust are delighted to be using the Giraffe House, which is the Adventure Play building in Burgess Park at the Albany Rd and Portland St junction. 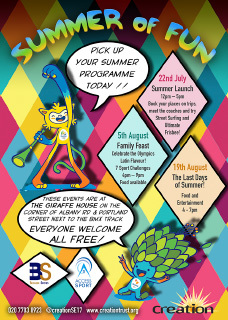 Friday 19th August 4pm-7pm – A Friday night family feast event where we will be thanking everyone for their summer work and planning for the Autumn terms after school activities. We will be targeting Temporary accommodation residents who are new to Walworth. 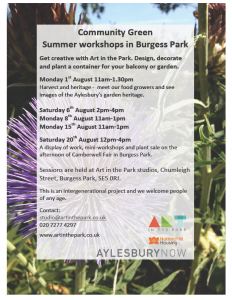 Get creative with Art in the Park at Chumleigh Gardens! Design, decorate and plant a container for your balcony or garden. Monday 1st August 11am-1.30pm Harvest and heritage – meet our food growers and see images of the Aylesbury’s garden heritage. 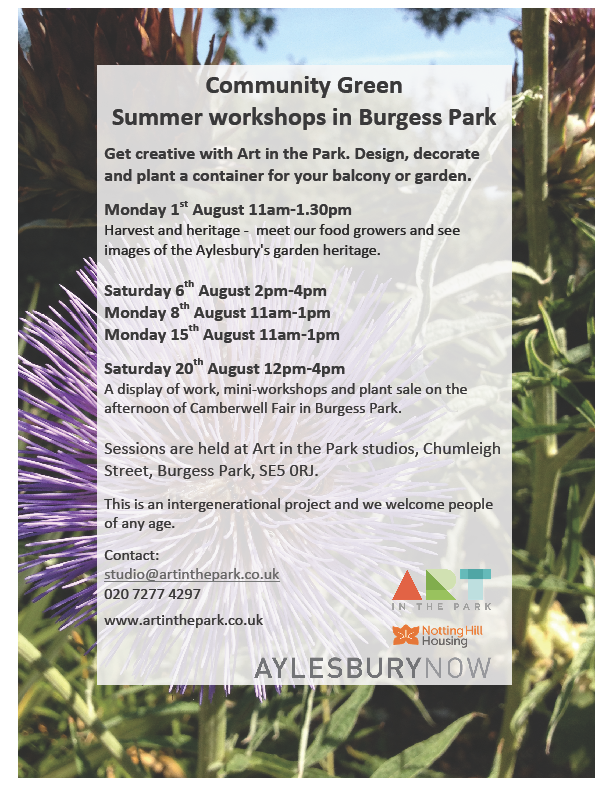 Saturday 20th August 12pm-4pm A display of work, mini-workshops and plant sale on the afternoon of Camberwell Fair in Burgess Park. This is an intergenerational project and we welcome people of any age. 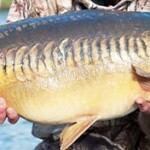 Sessions are held at Art in the Park studios, Chumleigh Street, Burgess Park, SE5 0RJ.